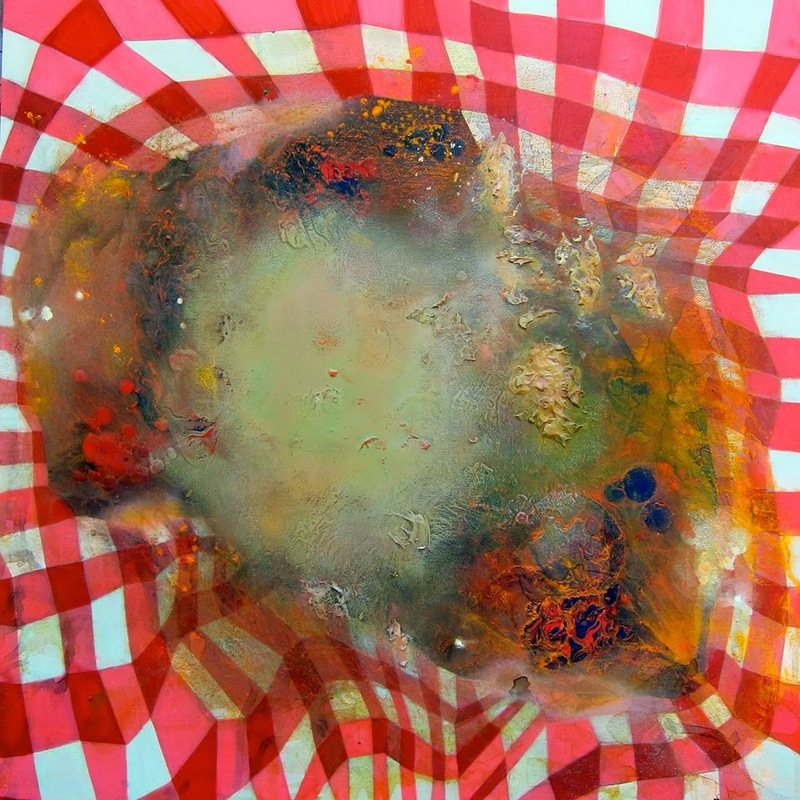 Jennifer Coates, Picnic, 48 x 48 inches, 2013. In the early 1990s, Rikrit Tiravanija began organizing exhibitions around cooking Thai food. A practitioner of what ultimately came to be known as Relational Aesthetics, Tiravanija was interested in the social interaction that revolved around cooking and eating. Today, artists are more likely to be thinking about our complex relationship with food itself–how we produce it, distribute it and consume it. 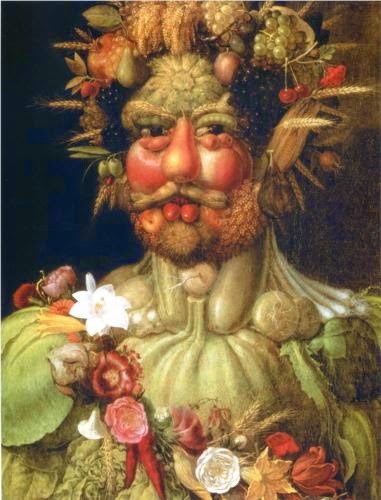 Giuseppe Arcimboldo, Holy Roman Emperor Rudolph II, c. 1590, as Vertumnus, the Roman God of plant life, growth, and the change of seasons. For instance, this summer at Smack Mellon Amy Lipton curated “FOODShed,” a group exhibition (open through this weekend) that explores aspects of food production and sustainability. Joy Garnett contributed home-fermented red wine vinegar concocted from old family recipes. Elaine Tin Nyo baked a sour cherry pie each day through the month of July until she had used all the cherries she picked at a farm upstate. Kristyna and Marek Milde created a temporary vegetable garden using shopping carts, soil, and plants to experience the process of growing food instead of buying it. As someone who cooks rarely and once broke off a long-term relationship because I was “tired of being the kitchen director,” I am surprised that so many women (Lipton guesses 90% of food and beverage artists today are female) are returning to the household and redefining farming, food production, and meals as art forms. Perhaps because raising kids is no longer considered a career killer, more artists, now mothers, find themselves back in the kitchen where they take a meta approach to their homemaking tasks. There’s nothing like shopping for and preparing three meals a day, every day, to make an artist think more deeply about the American obsession with food. Another who has embraced food and beverage art is Brece Honeycutt. Honeycutt, publisher of the fascinating blog On a Colonial Farm, has been researching the plants surrounding her 1792 Massachusetts home for several years. Using old recipes from colonial days, she makes beverages like Switchel and baked goods like rhubarb pie, and has begun exploring home remedies, which she will include in an upcoming exhibition in Massachusetts. 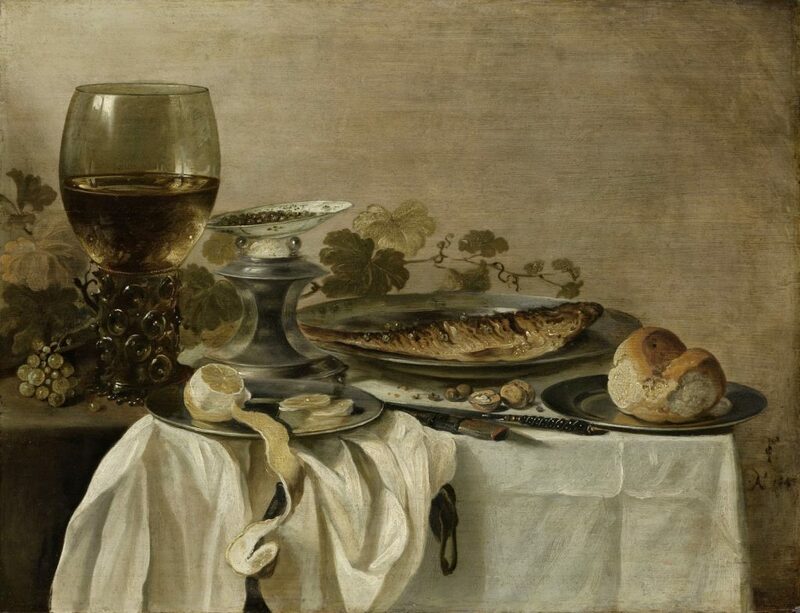 Pieter Claesz, Stilleven met een vis, 1647, olieverf op paneel, h 61.9cm × w 80.9cm. Via Rijksmuseum. 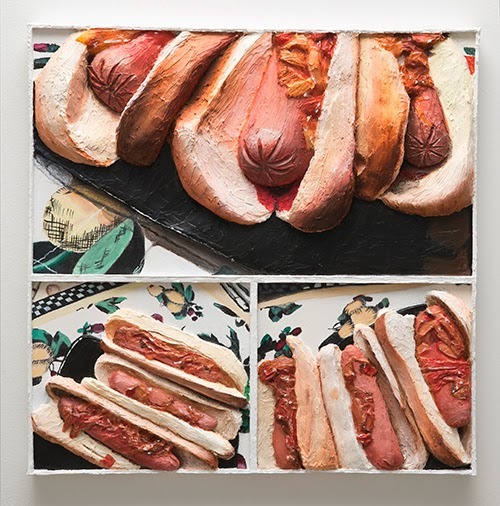 Gina Beavers, Kimchi Hot Dogs, 2014, acrylic on canvas, 30 x 30 inches. For painters, the tradition of painting images of food undoubtedly extends as far back as cave painting. Memorable food paintings of yore include Giuseppe Arcimboldo’s portraits (pictured above) from the 1500s, Pieter Claesz and the Dutch still life painters of the 1600s, Caravaggio’s rotting fruit, the early Cubist still lifes of Picasso and Braque, Wayne Thiebaud‘s desserts from the 1960s, and Andy Warhol’s iconic Campbell’s Soup Cans. Among contemporary painters, two artists stand out: Gina Beavers and Jennifer Coates. In paintings with raised relief, Beavers is reinventing the foodie still life thanks to Instagram, through which she tracks the #foodporn tag for imagery. According to the press release for a recent show at Retrospective in Hudson, NY, she selects images with “strong ‘Da Vinci-an’ compositions, intriguing ingredients, mystifying or amusing viewpoints, and novel framing.” She has recently begun using other apps to create #foodporn collages that serve as the basis for her new paintings. In her remarkable paintings, Jennifer Coates vivifies extreme close-ups of ordinary but unhealthy food like corned beef sandwiches, mac ‘n’ cheese, and candy bars with expressive, endearingly awkward paint handling. “It’s almost like I’m looking to excavate religious feeling from the most unlikely vessels,” Coates told me. “I’m trying to find what’s ancient and urgent in the processed ingestible. Even if it’s salad and more ‘natural’ it’s still the product of millennia of human tinkering. What if your salad was animated with strange belief systems. 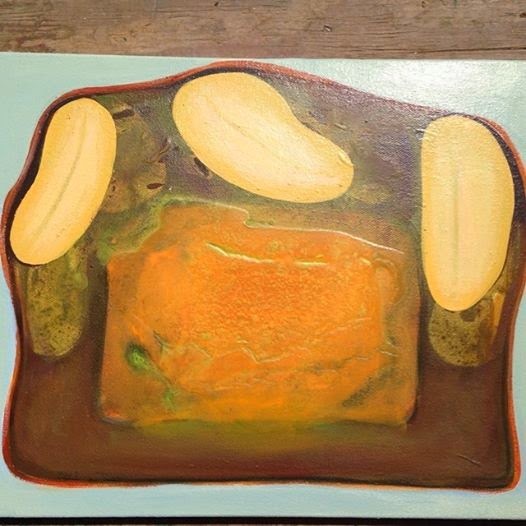 Or your sandwich was a megalith with the sun rising behind it?” Her work evokes our often irrepressible embrace of bad food: we eat it because it tastes so good, and then hate ourselves for doing so. Why does food have so much power over us? Other food exhibitions include an upcoming show of 35 Brooklyn artists at the Brooklyn Museum. The press release doesn’t mention which artists are included, but promises that local farmers will be selling fruits and vegetables out front on Thursdays. “Frozen Karaoke,” a group exhibition at Outlet Fine Arts in Bushwick includes custom-made ice cream. At Jeff Bailey’s new Hudson outpost, Jennifer Coates and Rachel Schmidhofer have curated an exhibition called “Tossed” that opens August 16 and will feature work about salad. Although all the artists mentioned above work in diverse media, from farm- and kitchen-based projects to studio-based painting practices, each manages to capture how much our relationship to food has changed since Claesz was painting his glorious still lifes nearly 400 years ago. Discussion questions: If you were going to make art about food and or beverages, what approach would you take? What are you having for lunch today? 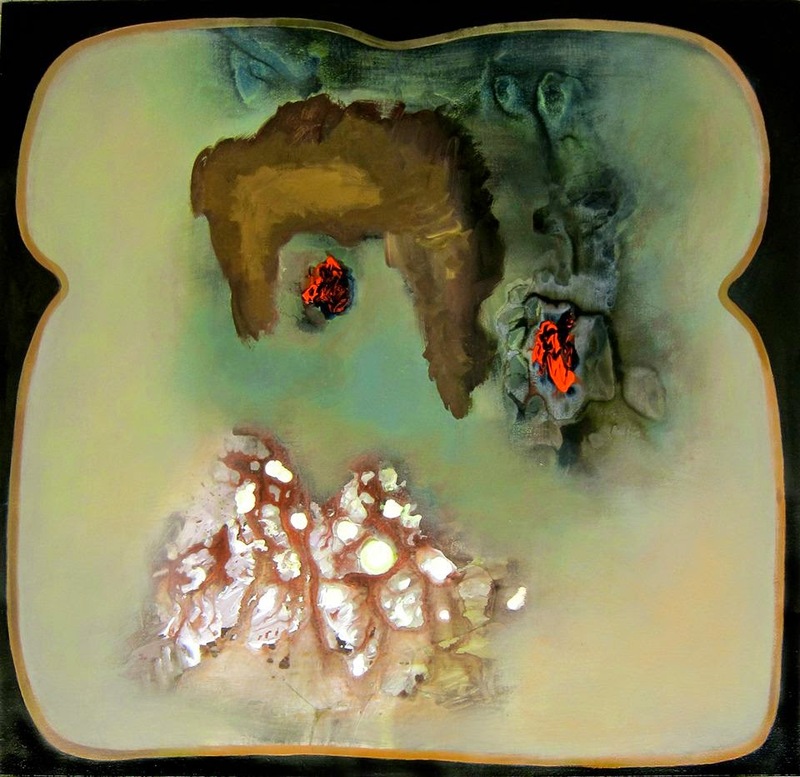 Jennifer Coates, Bread, 2014, 48 x 48 inches. Jennifer Coates, Baby Ruth, 2014.